A chicken love story of two rescued chickens who now have their first baby chick after a long struggle. 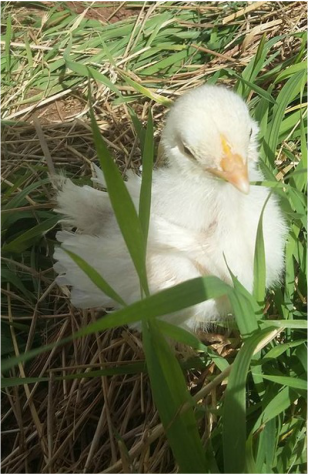 Watch our Featured Video: Mr. Snowie & Lady Frizzle's First Baby Chick-How it Began plus see Lady Frizzle's Story. Lady Frizzle suddenly stopped taking care of Lil' Snowball so I had to take over and then Baby Snowball got lonely so she tried to make friends with a ceramic chicken that literally scared the crap out of her but shortly after Lil' Snowball climbed atop the ceramic chicken and attempts to make friends. Lady Frizzle's story with before and after video's of her tragic rescue and wonderful recovery.